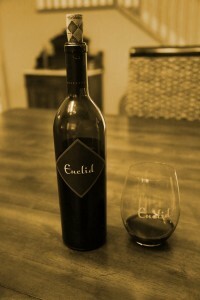 Euclid Wines was founded by father-son Mike and Lucas Farmer with their first release of a Cabernet Sauvignon from the 2009 vintage. However, their story begins much earlier than this. Mike grew up in El Sobrante (San Francisco Bay Area) and has a background in chemical engineering – prior to his work in the wine industry he was working in the plastics industry. Soon the wheels were in motion to what would lead to a move to the Napa Valley (1978). During his time at Opus One Mike became very knowledgeable about various coopers and how the types of barrels will influence a wine. He estimates he has personally overseen more than 300 barrel tastings over the years – evaluating various toast levels, flavor profiles and textural contributions among other factors. As a result of his extensive experience he has learned to carefully select certain barrels for Euclid’s Wines – paying close attention to qualities from the barrels that will create balanced wines. He says, “it is a sin to over oak and a sin to under oak”. Despite growing up in the Napa Valley and being surrounded by his father’s work – winery’s for Lucas were always a part of the ‘background’ during his formative years. He recalls his first memories of Opus One were spent shooting basketballs into a portable hoop for the employees while his father worked in the cellar. In 2003 Lucas took an extended trip to New Zealand focusing on outdoor adventure activities that this country is so well known for. Visiting wineries was the furthest thing on his mind during this trip – but when a friend suggested they visit a winery Lucas went with him. Interestingly enough, he had to travel half way around the world to be inspired by a winery. The winery they visited was for sale and Lucas soon had visions of he and his father purchasing it and starting an International wine business. At the time this winery was listed at approximately $110,000 USA dollars – and the price didn’t seem so bad. Upon returning to the Napa Valley his father soon talked Lucas out of this idea – but the seed of producing their own wine was sown. It also helped that Mike had been making home wine since 1990. Then the recession of 2008 hit and the price of grapes dropped significantly. Lucas realized the timing wouldn’t get any better than this and he approached his father about starting their own wine brand. This time, financially it made more sense. 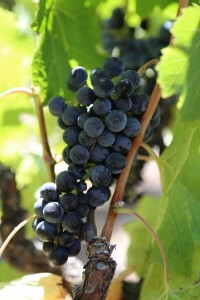 The focus is on a limited production Cabernet Sauvignon each year with other small production red wines offered based on vineyard availability and sources which vary each year. They source the Cabernet Sauvignon each year from the Clark-Claudon Vineyard, a small family owned hillside property located on the backside (North East) of Howell Mountain. Mike strongly valued the collaborative and team efforts of wine making during his time at Opus One; he encouraged different perspectives and creativity among his team members. This collective sharing of ideas by talented winemakers helped elevate their overall excellence of wine making. Today while making Euclid wines himself he does not have a team to consult with – however he and Lucas bring in others in the industry to help with certain decisions such as blending. Mike is a big believer in blending – adding additional nuances as needed to the wine – whether it is for mouth feel (textural), tannins or flavor among other components – not to mention the added benefit of additional components to work with during a challenging year such as 2011 (with rain and cool temperatures late in the Spring and early rain during harvest). The 2010 Cabernet Sauvignon (nearly 100% varietal) is an approachable extremely well-balanced wine in it’s youth. Aromatically it shows notes of black fig, darker cherry and vanilla. The wine is well-rounded with no sharp edges – it is seamless across the palate. The tannins are slightly earthy and are very well integrated on the finish. Notes of tobacco, chocolate, toasted oak and darker cherry linger. The 2011 Cabernet Sauvignon is a blend of 85% Cabernet Sauvignon, 7% Cabernet Franc and the balance being Malbec. The wine shows a nice balance on the bouquet; it is elegant and displays aromas of dust, herbal notes and smokiness as well as aromas of earth and dust watered by a recent rain. This bouquet has character that continues to evolve as the wine opens. On the palate more red fruit shows than darker with an interesting tropical nuance on the finish – notes of papaya (from the oak) framed by fine-grained dry tannins. At the time of our tasting, the 2011 perhaps has more character but the 2010 may have more a broader palate appeal. With access to several vineyards in the Sierra Foothills, Euclid Wines has made several limited production 100% Syrah wines. The 2011 vintage shows a bouquet that is ripe and appealing; it reveals layers of aromatic fruit including black cherry, blackberry and is complemented by toasted oak spices including clove and vanilla. It smells like dessert in a glass! The mouth feel is rounded with plenty of flavor – the finish is lively with firm yet well integrated tannins. This Syrah took Best of Class in the 2015 San Francisco Chronicle wine competition. The name Euclid was chosen to honor Mike’s step grandfather Euclid Farmer – a man who married his grandmother and inherited 8 children. Mike never met Euclid but looked up to him for his hard work and integrity – attributes they want to be known for in producing the Euclid Wines. And Euclid also happens to be his own middle name.